Oh yes, I am at it again - digging around in my craft supplies instead of getting on with existing projects or, heaven-forbid, doing some housework. 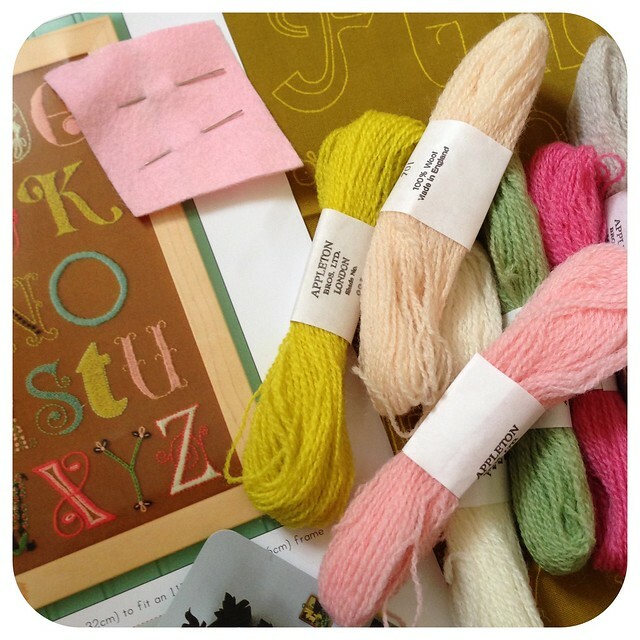 In fairness, this lovely Alphabet Sampler kit from Alicia Poulson has been waiting patiently for some time, and deserves attention. It also deserves someone more accomplished - this will be my first attempt at any embroidery since I was a child. A small hoop has been ordered and as soon as it arrives I'll make a start. In the meantime I'd better start practicing those stitches. Wish me luck! *Unlike previous cwtch-speak lessons, I am unable to recall where I first came across this word, but being so perfectly descriptive, is now firmly in my vocabulary. I am a big fan of procraftination - it's the way forward! That sampler is so cute! Can't wait to see when it's finished. PS Oh, and procraftinating? I nearly peed myself. I am definitely a Procraftinator, the whole reason that I learnt to Crochet was to avoid studying for an exam!!! Procraftination - the very definition of my crafting endeavours! I'm excited for you ~ I love it when crafters expand their ... well, crafts! Enjoy. I definitely identify as a procraftinator. Oh dear. You've got me pegged.